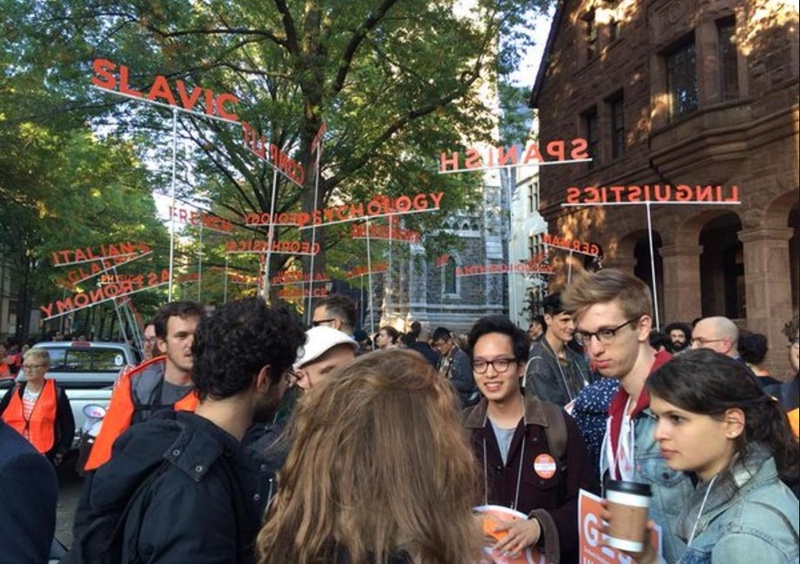 How academic workers have made their unions powerful tools for achieving racial justice. Over the last year, campuses across the country have seen fervent protest as students call administrators to account for their lackluster efforts on diversity and equity, and academic workers demand that the labor of teaching and research be recognized. Yale University, where I was a graduate student from 2009-2015, has been at the epicenter of both of these campaigns. In the fall of 2015, students of color and allies, under the banner NextYale, issued a range of demands including departmental status for Ethnicity, Race, and Migration; increased funding for cultural centers; and the expansion of health services and other resources for low-income, first generation, and undocumented students. At the same time, the Graduate Employees and Student Organization (GESO), the longest-running campaign to form a union of graduate students at a private university, released its fourth majority petition in two years and entered a new phase with the chartering of UNITE HERE Local 33. When I arrived at Yale in fall 2009, the struggle for racial and gender equity and the union campaign felt like worlds apart. I was well acquainted with the former through undergraduate organizing at the University of Virginia around faculty diversity, granting departmental status to African-American Studies, and ensuring adequate support to students of color. From my perspective at the time, these kinds of projects had nothing to gain from the unionization of graduate students. Moreover, in a city like New Haven where black and Latino unemployment was more than twice that of the white unemployment rate, building a union of graduate students, who were predominantly white, appeared to miss the bigger problem of racialized inequality. Over my six years there, I came to understand that building union power and seeking racial justice at the university could not be separated. Following GESO members who had successfully pushed Yale to divest from private prisons and who had led the fight for faculty diversity, I also came to see the union as a mechanism for pushing the university on questions of diversity and equity. In my first two years, I was a member of the Equal Rights and Access Committee, which included members of Local 34, Local 35, and undergraduate organizers and worked on early proposals for local hiring and a jobs pipeline. These demands would later be won through Local 34 and 35’s contract negotiations. Within GESO, the four majority petitions we filed over the last two years each included a racial and gender equity platform. And in my last semester there, with the support of hundreds of my colleagues, I filed a grievance detailing how the lack of faculty diversity meant that in the social sciences and political science specifically, I lost out on important sources of mentorship. A union is legally understood as a community of interest, and I learned in the work of organizing that the content of the community and nature of the interest is not determined in advance. Rather, it is made and remade through difficult conversations with colleagues and comrades and through struggle. That two-thirds of Yale graduate students would endorse a racial and gender equity plank with a demand for full funding of the Office of Diversity and Equity, a fair and neutral grievance procedure, affordable child care, and an expansion of women faculty and faculty of color was not given in advance, but created through hundreds of conversations. In the process of building our majority, we asked ourselves what we wanted a union for. The union and the principles it stood for did not emerge fully formed, but were knitted together from the experiences, grievances, and visions of members. I am incredibly proud that GESO and now Local 33 have carried the banner of racial justice at Yale — not only because this was central to my own experience, but because the question of racial and gender inequality must be at the center of our discussions of academic labor. The growing momentum of academic labor organizing is happening in the context of casualization. As is now well documented, 70 percent of the American professoriate is not on the tenure track. And this casualization trend is gendered and racialized. According to a recent report by the American Federation of Teachers, “a disproportionate number of underrepresented faculty members continue to be hired as contingent rather than full-time tenured faculty, which often marginalizes the contributions they could make to their institutions and provides them with grossly inadequate pay and working conditions.” In 2007, about 10 percent of all faculty positions were held by members of minority racial groups, and three-quarters of these were contingent positions. And a majority of contingent faculty are women. Studies also find that black contingent faculty earn less than other racial groups. In this context, unionization can make a big difference towards achieving racial justice. Debates about the material conditions of academic work and the right to organize and bargain over those conditions is central to ensuring that universities are more inclusive and just. First, contract negotiations over adequate and equal pay, benefits such as child care and parental leave, and transparent grievance procedures help to concretize the question of diversity as a matter of equity. At stake is not only access to the university, but the recourses — both material and procedural — to ensure students of color and women are supported. Second, beyond the contract, a union of graduate workers can offer alternative visions of what academic labor should look like and what a university means. As a community of interest with a recognized voice and representation, graduate workers can be at the forefront of challenging the trends of casualization and their gendered and racialized implications. Just as public teachers’ unions are making demands around equitable access to public education, and as service-sector workers across the country lead the living wage fight, organized graduate workers can also push for a more just and equitable university. With an overwhelming victory won at Columbia and an election coming soon for my comrades at Yale, we’ll soon see how this new union power can spur bold and inspiring visions of racial justice in the ivory tower. Given our national political moment, we can expect difficult times ahead for universities in general, and their most marginalized workers in particular. The emergence of the movement for graduate workers thus represents a hopeful development for 2017.